Today was the second match of our Grand Final run. It was perhaps the scariest moment of my life… so far of course…. We walked onto the pitch and was shocked to find the leading team in the competition standing there waiting to shake hands. There was something wrong….. You see we were ment to play the team just above us (in fourth place) on the ladder. If we won the game we would overtake them and we would have to win one more to secure a finals spot. So we thought were in for an even match, a fair game. And thats just what happened. I guess the only good thing about the game is that it was over quickly. They walked of the field, two hours into the game, with a clear victory in hand. They were ahead by 157 runs. Things weren’t good. “Now Boys! When you look back on this moment when you’ve settled down, will you wish you fought back! or will you agree that you let them win, like cowards”. He finished with a shout. And we walked out on to the field. His words had stunned us. What do we do? We aren’t cowards but we couldn’t come back from 157 runs! That seems to be all i’m doing lately. It’s all of got to be honest. I’m staying with my teammate, Robert Loxely. He’s a good bloke and a true friend. We train together all the time. We are all in hard training for our next match against Albion Park. The rest of the team aren’t as serious as they take the games as a hobby but we don’t. Me and Rob want to go further and be professional cricket players. I guess thats why we get on so well. So we are constantly training now. We train for 3 hours in the nets each day then got for an hour run after that. Its important we keep ourselves in peak physical condition! After all the members of the Australian Cricket Team don’t spend the day at the pub like the rest of our teammates! No, so we don’t either. We were talking last night and we both agreed that if one of got picked, the other wouldn’t rest till, they to, got in. I tried to talk to Mother yesterday. I saw her buying groceries at the general store and I over to her. It was my chance to talk to her without Father breathing on her neck. I had though that this was the reason that was causing her not to talk to me but it appears not. As soon as she saw me however she walked out of the store. Now im on my own completely. Well except for Robbo, what a legend! Categories: Uncategorized	| Comments Off on Hard Training….. I guess I a bit cruel about my family yesterday. I really love them even if they wont accept what I want to do. 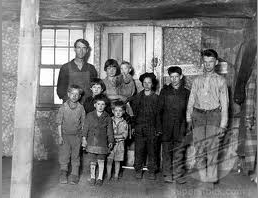 Here’s a picture of them and our cousins when they came to stay. Im the one on the right. The tallest. We won by 156 runs and 3 wickets! Its an amazing feeling to know that your on your way to getting a career you can’t stop dreaming about! Ah, its great! Pity my Father wont talk to me…. Aye he still angry. I tried to talk to him last night about the whole cricket thing but i didn’t work. I walked up to him after dinner and said “can we talk?”. He agreed and we sat down in front of the fire. I asked him “so have you..” but thats all i got to say. “What makes you think you can disert you family!” he roared at me. He seems to believe that if I go play cricket for a living, the family business will become bankrupt and the family will lose everything! And with that he kicked me out! But thats preposterous! I have 3 brothers who are devoted to the family business and wont let it fall into bankruptcy. Why would they? They all love building things and im the one being shouted at because i want to do something different! But i’ll show them. I’ll get that talent agent to notice me. I will never return to that house. Categories: Uncategorized	| Comments Off on 1 down, 2 to go! He basically lost it. He told me if i were to play cricket, I would never succeed in life I played cricket. But I think differently. I love playing cricket! I spoke to my cricket coach today and he told me about a talent agent that was coming down in a few weeks. He would arrive to watch the Grand Final of our league. My team is currently 5th on the leader board. I worked out that we’d have to win at least 3 out of the last 4 games before the finals. We play the first this weekend. I hope we win. If I made it to that Grand Final I could boost my career and possibly get noticed by this talent agent. I’ve decided what I want to do in life. I want to play cricket. My Dad wants me to be a builder and continue the family business. But i don’t want to do that, i want to live MY dream, not his. I’ll tell him tomorrow morning, God only knows how he’ll react…. Categories: Uncategorized	| Comments Off on Deciding..